The title of the fifth song on English Electric, Summoned By Bells, was pinched from Sir John Betjeman's book. Like Betjeman's poem, the song takes a look back at an earlier part of the subject's life, but in this case the memories are from my mum, Doreen, who grew up in a working class area of Leicester called Highfields. My grandad John was a wheeltapper and lived in a terraced railway house in Upper Kent Street, Highfields, for almost all of his adult life. 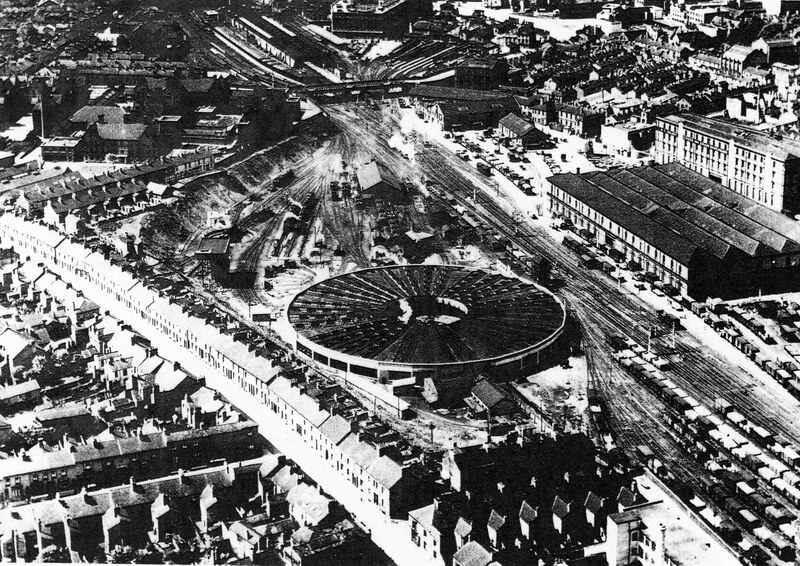 The photograph below shows the railway yard where he and my uncles worked (Leicester Shed). The row of houses lit up by the sunlight on the left of the roundhouse is Upper Kent Street. 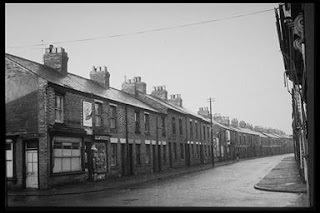 My mum has told me many stories about her upbringing in Highfields and, a couple of years ago, we decided to take a family trip back to the area to have a look around. We found that much had changed. 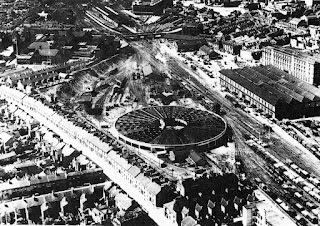 Leicester Shed is just sidings now; Upper Kent Street is gone and the roundhouse is no more. The population of the area has changed too and, in many ways, it's a very different place from when John and Doreen and her brothers lived there. However, the more we looked around the more familiar the place became to Mum. Many of the old redbrick buildings survive, including her old school. And the park at Spinney Hill where she played is still there (and still popular with the local children). There appeared to be a strong sense of community and, whilst Highfields is just an ordinary place, it seemed to me as good a place as anywhere. As we drove away, we stopped to let a young girl cross the road. If we had been able to stand in that spot 70 years before, that little girl could have been my mum on her way down to Spinney Hill park. With this image in my mind, more clear to me than the changes in Highfields, was the golden thread of continuity running down from the past. Summoned By Bells is about my mum's upbringing in Leicester and about our trip back to her childhood home. The early parts of the song are built around Danny's piano playing before the focus shifts to Dave's electric 12-string. The song also features our brass band, led by Dave Desmond, and the recorder playing of Jan Jaap Langereis. In the next two weeks on his blog, David will be telling the stories of the sixth and seventh songs on English Electric, Upton Heath and A Boy in Darkness. Your descriptive dialog captures my imagination and really make me want to visit that part of the world.